Ted prepares for a picnic outing with Father Jack. Mrs Doyle has prepared the sandwiches, they are egg, the only sandwiches Ted hates. Ted and Jack arrive at the desolate picnic site and sit quietly. Later, even though they are the only ones there, they are asked to move by some regulars. The groundskeeper, Benson, manages to defuse the situation by using a loud whistle. Ted and Jack leave in disgust. Back at the parochial house, Ted becomes aware that Dougal is under the influence of a young rebellious priest, Father Damien Lennon. Dougal pokes fun at Ted for being so unhip and uncool. 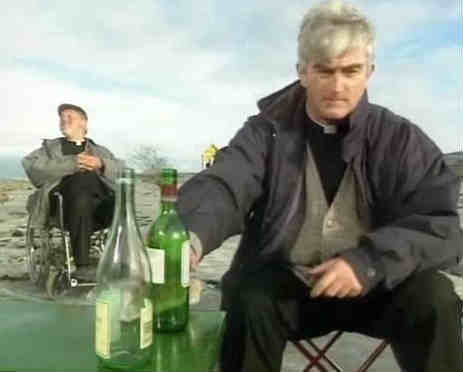 That night Craggy Island is shaken to its foundations. Someone steals Benson's whistle from his cabin, and they even flash an obscenity at him before leaving. The crime wave that has hit Craggy Island leaves its populace in uproar. Ted discovers the whistle in a packet of cigarettes in Dougal's coat. Ted tries to pressurise Dougal into coming clean about the event, but Dougal is totally clueless. Benson, now in a wheelchair due to shock, and Sergeant Hodgkins enter the parochial house. 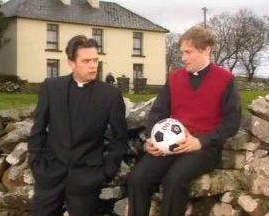 It is announced that a witness claims a priest took the whistle, so Dougal, confused, blurts out that Ted took the whistle. Ted leaves to think up an explanation. While Ted is gone, Father Frost enters holding Father Lennon by the ear. Father Frost has discovered that Father Lennon stole the whistle and attempted to frame Dougal. Ted comes back in and spins a ridiculously convoluted storyline about what prompted him to steal the whistle. Then he realises that all is well. Ted gives Dougal a lecture about putting his trust in people who are "cool". Asked if he has learnt anything, Dougal replies "no". Father Ted: No... no Dougal, that's us. That's Catholicism you're talking about there. Mrs Doyle: Here are the sandwiches for the picnic, the rest are in the kitchen. I hope you enjoy them Father. Father Ted: I love a sandwich from time to time. It doesn't matter what flavour it is as long as it isn't egg, because you know how much I hate egg Mrs Doyle. God even the smell of them brings me under a terrible rash. I tell you, I wouldn't even eat an egg sandwich if you paid me. The horrible stinking smelly things as I told you before. Remember me telling you earlier Mrs Doyle any thing except egg and I wanted anything at all as long as it wasn't egg - they're egg aren't they, Mrs. Doyle? Third appearance of Larry Duff who gets caught up in an arms trading scandal. Fourth appearance of Mary and John. Ted buys firelighters from their shop. Jack can recognise the vintage of wine bottles just by listening to the noise they make when they are clinked together. Ted is reading the book The Life of Mel Gibson at the picnic. Ted once snuck out with some of the lads at the seminary to go to a Dana concert. Dougal is nearly 26 years old. For three years Mrs Doyle has been waiting in the dark in the living room at night with a tray of tea just in case anyone should need a cup. The title is a pun on the BBC2 British music television series The Old Grey Whistle Test, which ran from 1971 to 1987.